Telescopic Design – Can Reach up to 78.5 inches, No matter where your ball goes, if it can be seen, it’s back in play or in your bag. It’s easy to use and will help you save time and energy so you can focus uniquely on improving your game. Easy to pack and carry, it fits right into your golf bag. 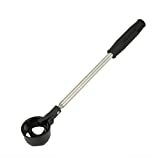 With long reach of this golf ball retriever, it’s a valuable aid for any golfer to retrieve those hard to get balls. Easy to use and speeds up play. This golf ball retrievers make all other ball retrievers obsolete.